I’ve recently added a new section to my Etsy shop, called Tinctures, where I offer digitally recolored versions of some of my most popular prints. I know not everyone shares my rabid enthusiasm for highly saturated colors, & to be honest, sometimes I’m in the mood for something a little more subtle myself! I do the recoloring in Photoshop, & I try to create a pleasantly muted effect without completely losing the color variations of the original– keeping just a breath of the original hues. My word-loving friends may be curious why I call this series “Tinctures.” Though most commonly used today to describe a medicinal alcohol extract, “tincture” can also mean a tint or color. In fact it originated in Middle English, from Latin tinctura act of dyeing, from tinctus, past participle of tingere to tinge. I like to think of these as coffee-flavored versions of my work! (Yes, I’m a java junkie.) What does that make the originals, I wonder? Fruit salad, perhaps? 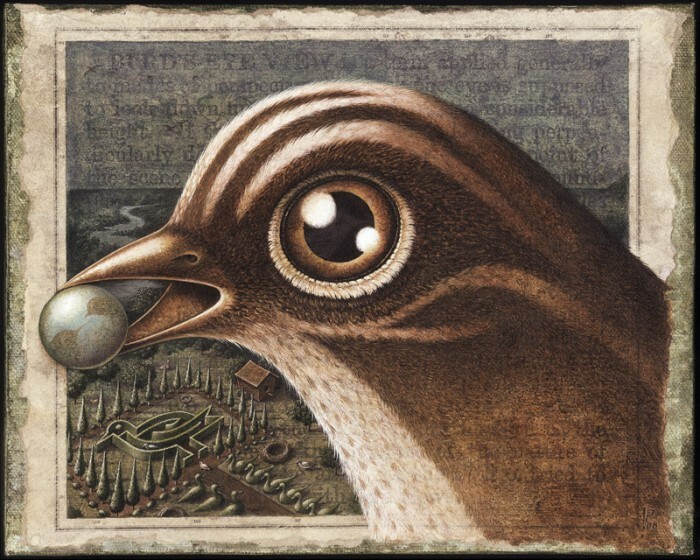 This entry was posted in Art, Prints Available and tagged Art, Birdland, Coffee, Etsy, Prints, Sepia, Tincture on 24July 2014 by Leah.